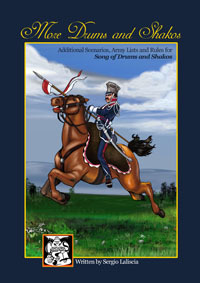 More Drums & Shakos is a supplement for the 2009 Origins Award-winning Napoleonic skirmish game Song of Drums and Shakos. It includes new rules, special rules, weapons, 4 scenarios and army lists for most Nations involved in the Napoleonic wars. - Fight the War of 1812, the Tyrolean rebellion of 1809 and the bitter struggle of the French and their allies against Guerrillas in Spain! * * * This book is not a stand alone game. You need a copy of Song of Drums and Shakos to play. Jeremy Ward 10 9 9 Great, I got this for the Wurttemberger list but will now end up recruiting Spanish guerrillas! Cheung Kar Fai 10 10 10 I can play this game with limited space, time and resources, excellent. Michael Schroeder 10 9 9 As will all of the "Song of..." supplements, "More Drums & Shakos" continues to maintain the high standards I have come to expect. A valuable addition to a great miniatures skirmish line. Get it now! !